A stunning 1980s necklace by Fabergé, shown by the lovely Rachel of 66 Mint. A few weeks ago I had the pleasure of attending the New York Antique Jewelry & Watch Show at the Metropolitan Pavilion in Manhattan. What a glamorous bazaar it was, with booth after booth of some of the most amazing fine jewelry on the planet! The first passageway inside the Metropolitan Pavilion. 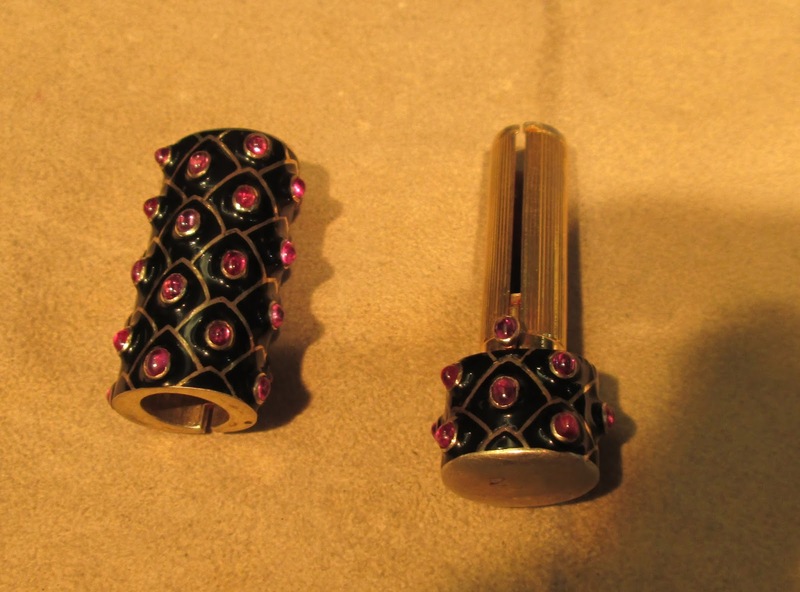 Pavé diamonds, tourmalines, and pink Guilloché enamel, set in yellow gold. J’adore! Above is a detailed shot of the magnificent Fabergé necklace at the 66 Mint booth. Of course when I hear Fabergé I immediately think of their world-famous eggs, so I always forget that they even make jewelry, let alone this drop-dead gorgeous necklace from the 1980s, which I think is perfectly wearable today! Someone else must have thought so too because I see from the 66 Mint website that it is now sold. Whoever owns it now is one lucky lady! 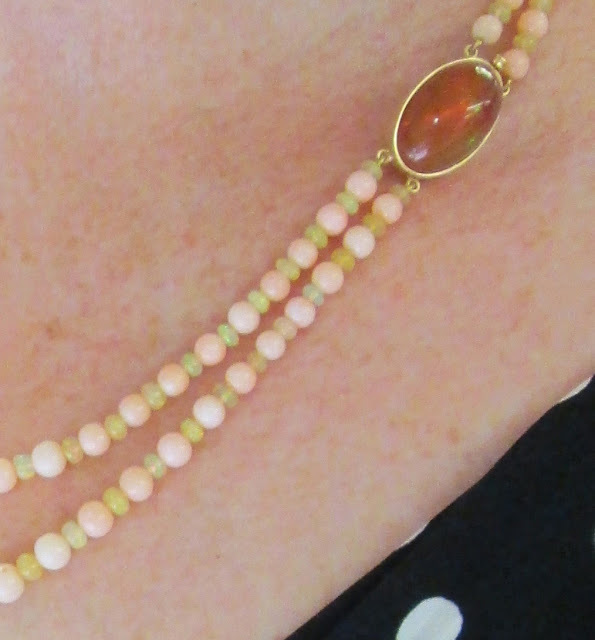 My mother in an angel skin coral and opal necklace. At the Harley Brown booth my mother tried on an exquisite necklace made of angel skin coral and opals. I have never seen a necklace like this and it was stunning on my mother! Amazing graduated beads of angel skin coral, with opal in between. Even the clasp is of opal! A trio of necklaces by Van Cleef & Arpels. I fell hard for several pieces at the M&G Signed Jewelry booth. 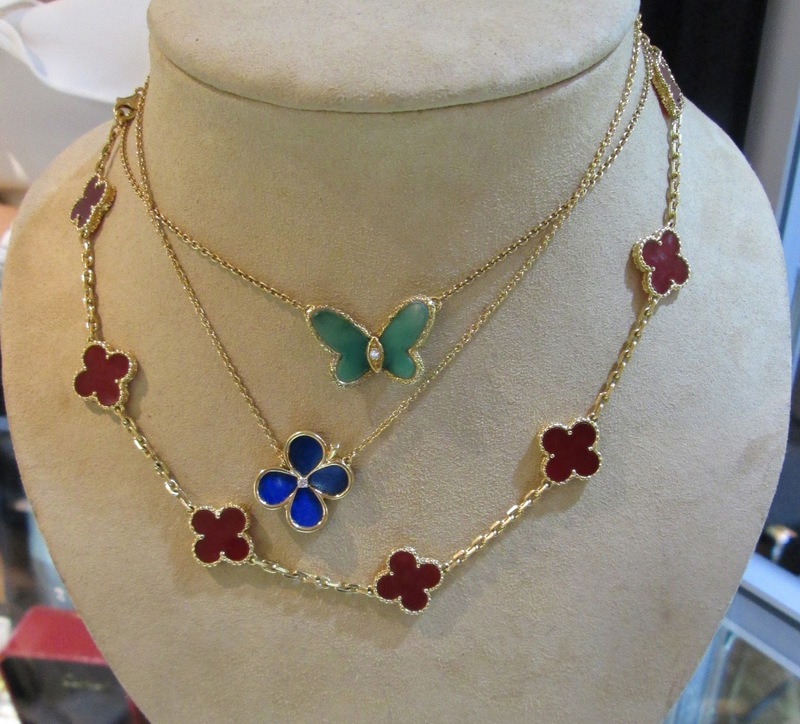 I loved these Van Cleef & Arpels necklaces, especially the Lapis Lazuli Clover pendant with a diamond center, from 1973. Gorgeous! I would wear that all the time if I owned it. A Van Cleef & Arpels Lion Ébouriffé brooch from 1962. 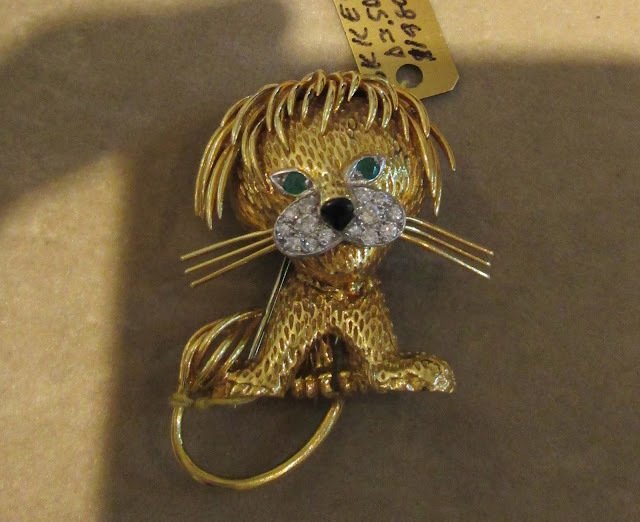 Another thing I loved at M&G Signed Jewelry was this 1962 Lion Ébouriffé or “Tousled Lion” brooch, by Van Cleef & Arpels, which features a 18K gold lion with pavé face, black enamel nose, and emerald eyes. 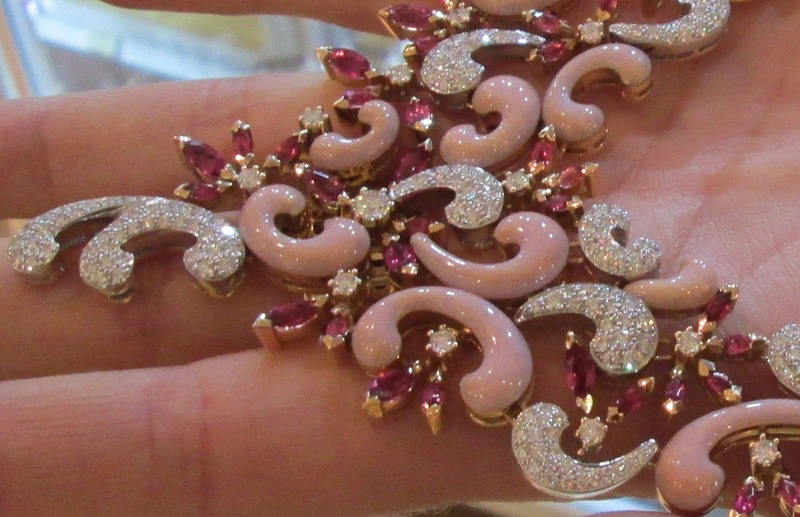 Princess Grace of Monaco owned one of these exact brooches! Van Cleef & Arpels sets of coral and turquoise and pearls. 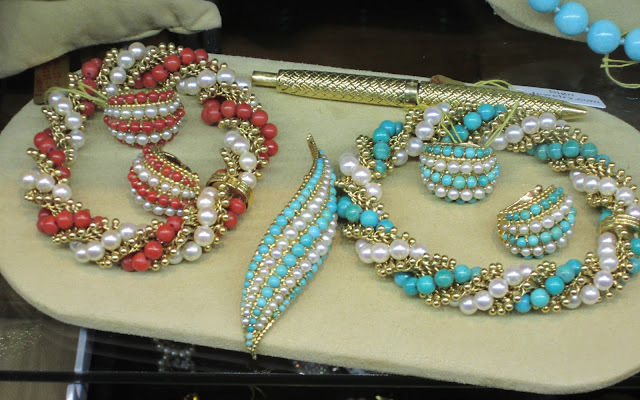 Yet another favorite at M&G were these 1960s Van Cleef & Arpels sets of bracelets and earrings featuring red coral and pearls and turquoise and pearls. I especially love that turquoise and pearl brooch in the center. Isn’t it divine? One of the shows many aisles of exhibitors. A Boivin lipstick case from the 1930s. I weep! 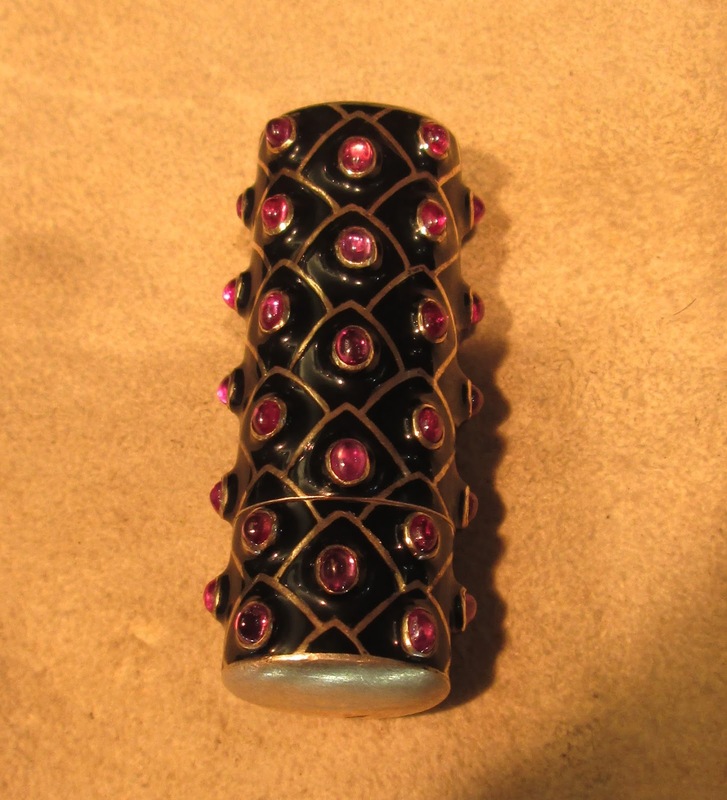 I went nutty for this beyond-gorgeous lipstick case from the 1930s by renowned French jewelry house Boivin. I think it may have been my single favorite thing at the show! It was at the Larengregor SA booth and the (very handsome and charming) young Swiss man who showed it to my mother and me pulled it apart and said, “You can still smell the lipstick.” And you could. At the bottom of the gold cylinder insert was the tiniest remnants of the boldest red. The case was heavy and supremely elegant and so old school. It is made of black enamel, gold, and tiny cabochon rubies. Can you imagine having this in your handbag? 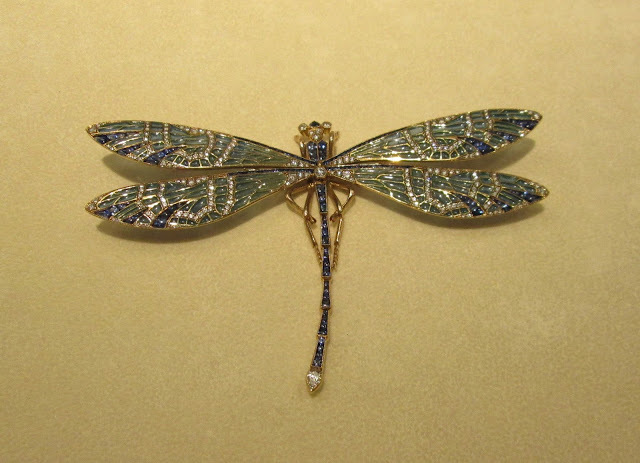 I read over at Antique Jewelry University that during the 1930s and 40s the house of Boivin was run by the widow of René Boivin, the founder who died in 1917 at the age of 53. René’s widow, Jeanne (sister of couturier Paul Poiret! ), along with three female jewelry designers, Suzanne Vuilereme (later Belperron and famous in her own right), Juliette Moutarde, and Boivin’s daughter Germaine, helped the house reach the zenith of jewelry design. So how about that, ladies and gents? This lipstick case was designed by a WOMAN! Note the tiny cabochon ruby lift that brings the lipstick to the top. I love this case! I tried on this extremely gorgeous fire opal and spinel ring! 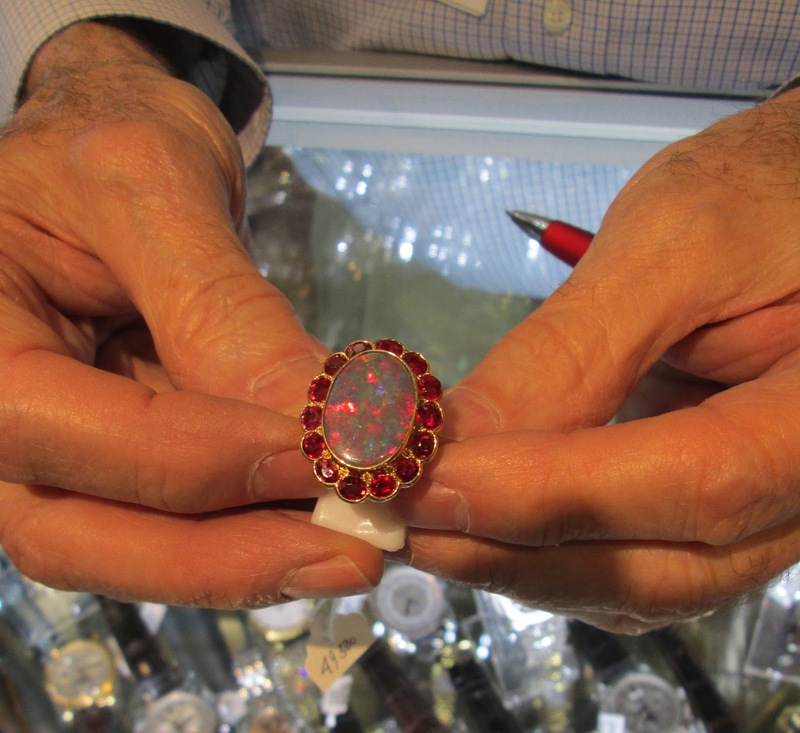 At the Aaron Faber booth I had the pleasure of trying on this glorious ring of a center fire opal surrounded by bright red spinels! You cannot take your eyes off this ring, it flashes color from every angle and is so dramatic and wonderful. An intricate and beautiful dragonfly brooch. This explains why the wings look so gorgeously luminous! A detailed shot of the wings. 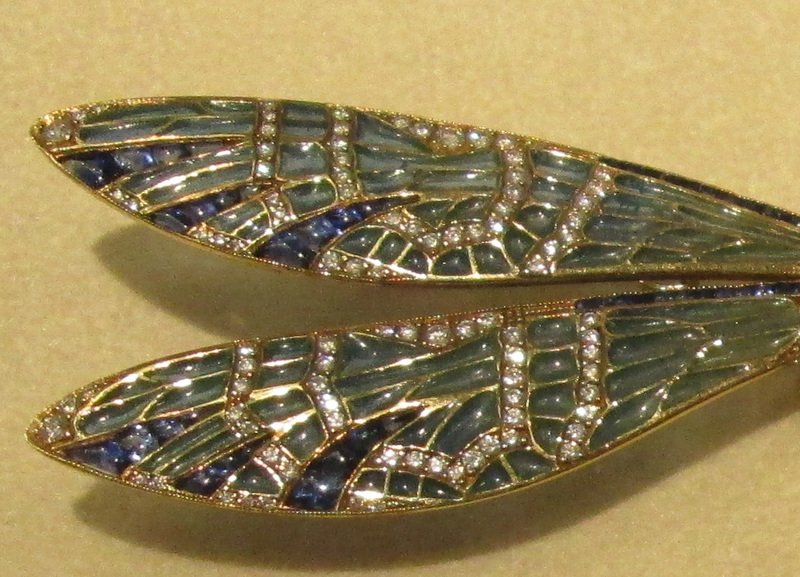 An early 1960s Van Cleef & Arpels “Chat Malicieux” brooch. 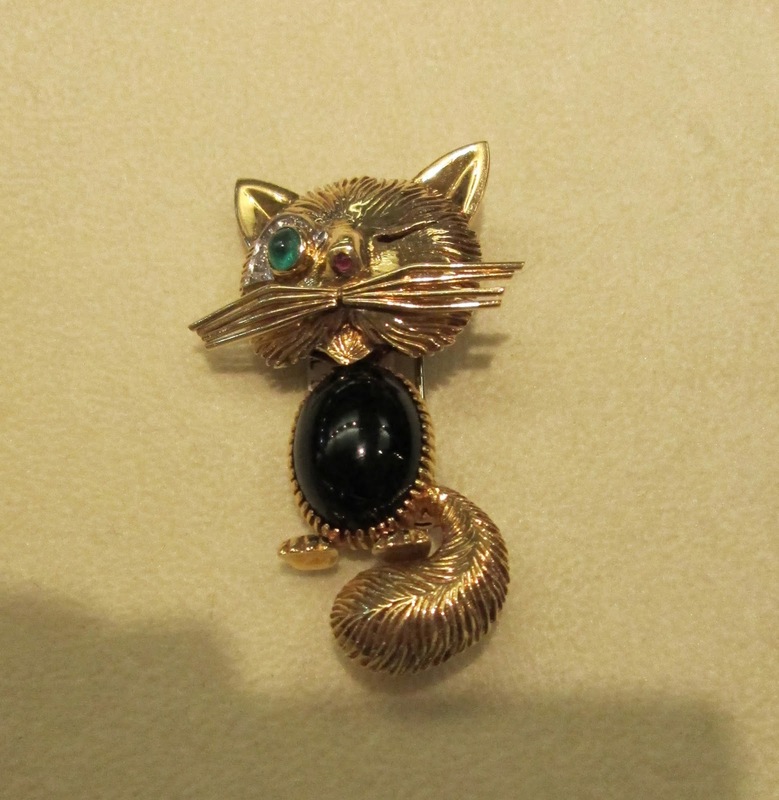 Also at the Morelle Davidson booth was this crazy and fun “Chat Malicieux” brooch from the early 1960s by Van Cleef & Arpels. It is made of gold, pavé diamonds above the emerald eye, a tiny ruby nose, and a bulbous onyx body. So great and for cat lovers everywhere! My cat Tippi actually gives me a very similar look to this on some mornings before she’s had her Fancy Feast! If I could own two items here I would pick the 1973 Van Cleef & Arpels Lapis Lazuli clover pendant and the 1930s Boivin lipstick case. How about you? Thank you to the U.S. Antique Shows and New York Antique Jewelry & Watch Show teams, as well as every exhibitor who took the time out to talk to me, show me something beautiful, and teach me something new. If you get a chance to attend one of these shows around the country, I highly recommend it. You will have one glamorous and fantastic time! Ps your mother has perfect skin!!! My mum gave it to me as a birthday present! The red Van Cleef necklace calls to me. It would be my constant companion. The ruby cabochon lipstick case is beyond stunning. Can you just envision Lady Mary from Downton Abbey with it. I usually go to the annual Feb. Naples Jewelry & Art Show. There have been some stunning pieces there. The Naples Show also had vintage Chanel handbags, as well as other vintage designer handbags. Had a hard time leaving that booth. I have yet to attend this show but have visited the Vintage shows at this location. Such gorgeous items you are showing here, so fun to browse and enjoy the beauty! I actually do like antique jewelry; esp. from the 1920s as it's usually not terribly expensive...or at least that used to be the case. Your mother looks fab in that gorgeous coral and opal. Adore the lipstick case! And that top necklace is so beautiful...what a fun event Jill. I would want to be there for days.